Outback Northern Territory is a great area to visit. 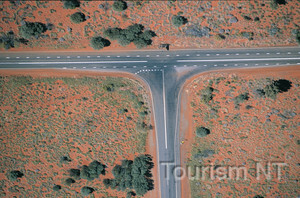 Stuart Highway is a great drive right through the middle of Australia’s Red Centre. It goes all the way from Darwin in the Top End of Northern Territory to Port Augusta in South Australia, and nowadays you can make the same trip on the classic train The Ghan. Here is some information about the trip, and in the end of the page is an Australian outback map, showing the route. Darwin is the capital of Northern Territory and a great city to visit. There are a few good museums and crocodile parks as well as the famous wharf and Mindil Bay Markets. Some of the places to stay are Asti Motel, Banyan View Lodge, Barramundi Lodge, Chilli's Backpackers, Comfort Inn Vitina, Hi Way Inn Motel, Holiday Inn, Melaleuca on Mitchell, Palms Motel, Paravista Motel, Poinciana Inn, Value Inn, and Youth Shack. For campers there are the Hidden Valley Tourist Park and Shady Glen Tourist Park. As you drive south from Darwin, you pass by Darwin Crocodile Farm, Noonamah, and then the turnoff to Northern Territory Wildlife Park, Berry Springs Nature Park and Orchid Gardens. Further south is Lake Bennett, and not far south of it is the turnoff to Bachelor and Litchfield National Park. 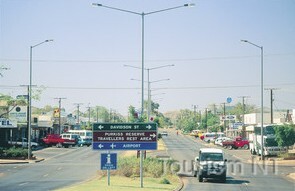 Bachelor is a small township, mainly known as the gateway to the park, and as Australia’s first uranium mine. Today there are the Rum Jungle Hotel (named after a rum supply wagon got bogged here in the 1800s, yum) and a few other places to stay. Back on the highway, further south you come to Adelaide River – a friendly township with a hotel (pub), police office and railway station, and both Aboriginal and European history. Adelaide River was also one of the military headquarters during the WWII. A nice place to stay is Mount Bundy Station. Further south along the highway you pass by Hayes Creek and Emerald Springs Roadhouses, and then you get to Pine Creek. Pine Creek is a small friendly town, known for its gold rush in the 1800s. Today there are the National Trust Museum, Railway Station Museum and an open-cut gold mine. There are a few caravan parks and the Bonrook Country Stay. South of Pine Creek is Katherine – the biggest town in the area. 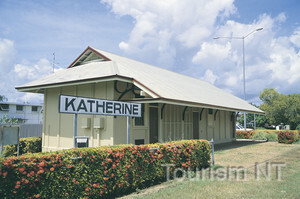 There is a visitor information centre on the main road, and some places to visit are Katherine Museum, Railway Museum, and Katherine School of the Air. Places to stay include All Seasons, Best Western Pinetree, Donkey Camp Bed and Breakfast, Katherine Motel, Knott’s Crossing Resort, Maud Creek Country Lodge and Springvale Homestead. Katherine’s best attractions however are outside the town. North-east of the town is the famous Katherine Gorge in Nitmiluk National Park where there are some great bushwalks, the longest to Edith Falls; and the gorge is very popular with kayakers although you can also take a boat tour. A great place to stay here is Nitmiluk Chalets. South-east of Katherine is Cutta Cutta Caves – some of the best limestone caves in Australia. The caves are a part of some 1500 hectares of karst landscape and there are some excellent stalactites and stalagmites. The caves are also home for some rare species of bats and snakes. 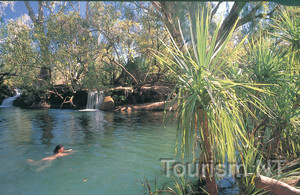 South of Katherine is Mataranka – a small town famous for Elsey National Park and Mataranka Thermal Pools. It’s a great place to have a dip, with water constantly 34°C. 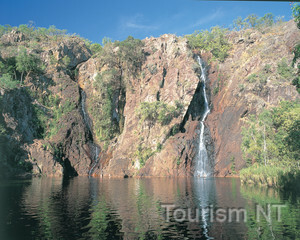 In the Elsey National Park, there are also Bitter Springs, Stevie’s Hole, Mataranka Falls and a botanic walk. The area was the scene of the book “We of the Never Never” and if you know the book, you may want to go and see the Elsey Homestead replica and the Elsey Graves. Places to stay in Mataranka include Territory Manor Hotel, Mataranka Homestead Tourist Resort and Coodardie Station Stay. South from Mataranka the lush green vegetation ends and desert landscapes start. 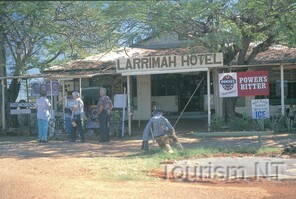 The first stop is Larrimah, a tiny place with Larrimah pub (which also is a hotel and there are camping places there too). There is also a local museum, and the old telegraph station, and some historical WWII sites. South of Larrimah is Daly Waters. 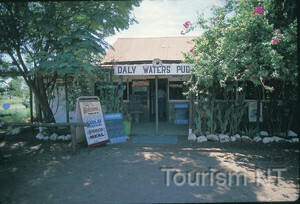 If you thought that Larrimah Pub was a classic outback pub, wait until you get to the one in Daly Waters. It is a few kilometres off the main road, but worth turning in. In fact, it’s worth a night and a few beers with locals, and there is also a fair bit of memorabilia to go through – the walls are covered in old ID cards, all sorts of stickers and there is also a museum. South of Daly Waters is the Hi-Way Roadhouse, where Carpentaria Highway goes to Gulf Savannah. South from Hi-Way is Dunmarra – another small place with the Dunmarra Wayside Inn Hotel. Further south are more small places like Newcastle Waters, Elliott, Renner Springs Roadhouse, and the historical Attack Creek and the Churchill's Head Rock. South from there is a john Flynn Memorial, and the Threeway Crossroad, where Barkly Highway that comes from Mount Isa in the Outback Queensland, joins the Stuart Highway. There is a roadhouse and camping places right at the crossroad. 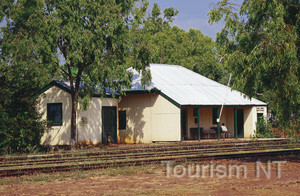 A bit south of the crossroad are the Pebbles, a Telegraph Station, and a bit more sizeable town – Tennant Creek. There is heaps to see and do in and around Tennant Creek. It is a historic gold mining town so today you can visit the Battery Hill Mining Centre, but there are also the Nyinkka Nyunyu Aboriginal Cultural Centre, the Pink Palace, May Ann Dam, Bill Allen Lookout, Tuxworth-Fullwood Museum, and Tennant Creek Telegraph Station. Places to stay include Eldorado Motor Inn, Bluestone Motor Inn, and a few caravan parks. 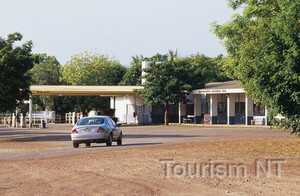 South of Tennant Creek is Wauchope – a small one-pub town where there is accommodation in the Timbertown Resort and Motel. Just outside the town are Devils Marbles – some of the most famous rock formations in Australia. They are large granite boulders that balance on top of each other in a way that makes them look like they should fall any minute. Local Aboriginal People’s legend goes that they are eggs of Rainbow Serpentine. There are some bushwalking tracks here and a camping ground if you want to stay over the night and get some sunset and sunrise photos of the marbles. South of the Devils Marbles is Wycliffe Well, a place that has turned its past UFO sightings into a tourist attraction and painted some walls and put up some statues of aliens. There is also a pub, and camping as well as accommodation in the Wycliffe Well Holiday Park and Cabins. South from Wycliffe Well is Barrow Creek – a small historical place with a pub, an old telegraph station and a few other historical buildings. In modern times, Barrow Creek got famous for the disappearance of the British backpacker Peter Falconio. 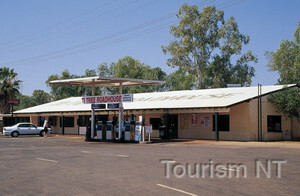 Further south is Ti Tree, a small township with a roadhouse, shop and camping places. Ti Tree is mostly famous for its Red Sands Art Gallery. 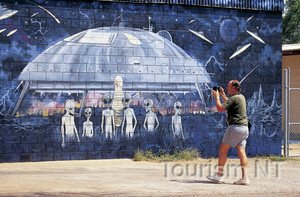 South of Ti Tree is another roadhouse with an art gallery in Aileron. It was once part of the historical Glen Maggie Station. Nowadays there is an Aboriginal Art Gallery that displays some of the famous paintings by Albert Namatjira and other famous Aboriginal artists. Just south of Aileron Roadhouse is the historical Ryan’s Well that was built in the late 1800s and worked until the 1930s drawing artesian water to the surface. The next stop south is Alice Springs – the largest town in the outback Northern Territory. Some of the places to stay in Alice Springs include Alice Lodge Backpackers, Alice Motor Inn, Desert Palms Resort, Desert Rose Inn, Toddy's Backpackers and White Gum Motel. 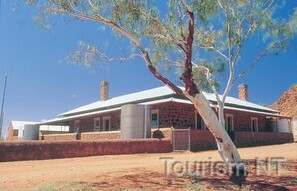 Click here for the full list of Alice Springs Accommodation. Alice Springs. Poster by AllPosters. Click on thumbnail to buy. There are a lot of great national parks west of Alice, like West MacDonnell Ranges, Kings Canyon, Finke Gorge and Ayers Rock Australia. East of the town are East MacDonnells: Corroboree Rock, Trephina Gorge, Arltunga and Ruby Cap. Those places are less visited than the national parks west of Alice, but they are equally beautiful, although some of them, particularly Ruby Cap is quite remote. There are also some remote side-trips south of Alice Springs. You can reach Rainbow Valley and Ooraminna Station either by driving a dirt road south-east from Alice Springs, or by turning east off the Stuart Highway south of Alice, at Stuarts Well Roadhouse. Chambers Pillar is also reached by the same road, however the last part of the road that takes you there is fairly rough so you definitely a 4WD vehicle. Further south along the Stuart Highway there are Erldunda Roadhouse and Kulgera Roadhouse before you cross the Northern Territory – South Australia border and enter the outback of South Australia, where the Stuart Highway continues south towards Port Augusta. On the western side you have the huge Victoria Desert, and on the eastern side you have Pedirka Desert, Simpson Desert, and further east Sturt Stony, Tirari and Strzelecki Deserts. As you drive south along the highway, there are small places like Agnes Creek, Chandler, Marl, and Cadney Homestead Roadhouse before you come to Coober Pedy – a town famous for its underground homes, hotels and museums – a great solution to how to escape the heat and dust storms. Places to stay include the Comfort Inn Experience, Desert Cave Hotel, Down to Earth B&B, Mud Hut Motel, Opal Inn, and Radecka Backpackers. East of Coober Pedy is the William Creek Road that goes to Anna Creek, and further into Lake Eyre National Park – a fantastic salt lake, fairly dry during the droughts but when the rains do come along, waterbirds do too. South of Lake Eyre, the Oodnadatta Track takes you to Curdimurka, Bopeechee and Marree; and further east are Strzelecki Desert and Innaminka. Here is an Australian outback map, showing the Stuart Highway. I have tagged the places that I mentioned on this web page. You can click on the tags to see what places they are, and double-click anywhere on the map to zoom it in and see the places closer. Drag the map to move around, and if you want to see the satellite image with Google Earth, click on "Sat" in the top right hand corner. We all love to read about other travellers' experiences!